LG CNS, an information technology services provider under South Korea’s LG Group, has launched smart factory platform Factova equipped with artificial intelligence, Internet of Things and big data processing technology solutions, the company said Tuesday. Short for a combination of “factory” and “value,” Factova aims to optimize a factory’s overall operations -- including product planning, design, production and logistics -- by leveraging AI and big data analytics, LG CNS said. The firm built its smart factory solution based on an array of test cases involving diverse clients including materials and parts makers LG Chem, LG Display and LG Innotek as well as LG Electronics which builds finished electronics goods. According to the IT services provider, Factova was able to cut down the time conventional required to conduct market research, product specification selection, product design and manufacturing from more than 6 months to 2-3 months. In the production front, the smart factory solution uses IoT to monitor and keep track of data from every manufacturing piece of equipment in real-time, enabling clients to immediately catch glitches and address them. 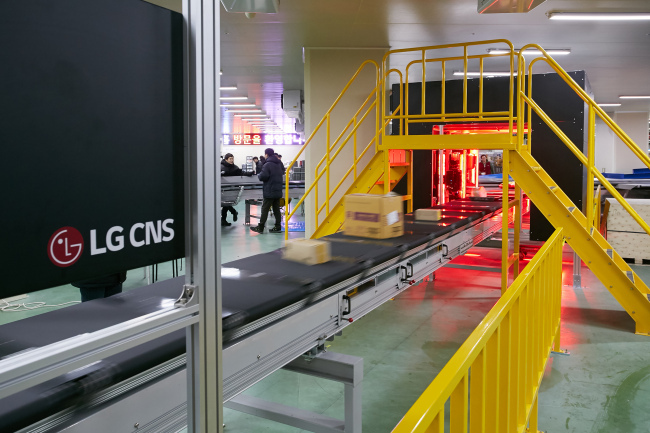 In addition, LG CNS said its big data platform leverages deep learning to raise the accuracy of a factory’s quality control procedures to as high as 99.7 percent. It also improves logistics management including trackin inventory and shipping procedures. LG CNS plans to foremost apply its Factova smart factory platform to newer facilities including LG Electronics’ washer production factory in North America, LG Display’s OLED manufacturing plant as well as LG Chem’s battery production plant in Poland. From there, the company will work on bringing Factova to other existing plants, while also continuing to upgrade the functions and capabilities of its smart factory solution, it said.